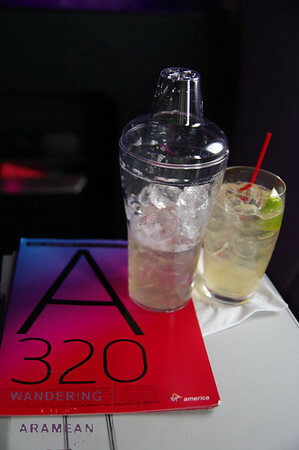 Virgin America wants things to be different. Very different. David Cush, the carrier’s CEO recently was interviewed by Scott Mayerowitz from AP and there are a few interesting bits in the Q&A that offer up a rather unique view of how he sees the company fitting in the market and how his old company, American Airlines, is doing these days. Here are a few of the bit I found most entertaining. Q: How much more are people willing to pay for [food & entertainment on demand] services? A: The model is getting them to pay the same amount with a much lower production cost. For a guy who thinks he’s looking at the bigger picture and the long-term view of the airline it is not at all clear how he plans to maintain this approach. Every airline starts out with lower costs initially. The problem is that maintaining that cost structure is incredibly difficult as labor seniority (and the correlated costs) only go up over time. Yes, the new fleet means decent fuel efficiency but that will erode (or require major capital expense) over time as well. Doesn’t seem to be a particularly useful approach to long-term survival. Q: How can you attract business travelers when your miles can’t be redeemed for Hawaii, Europe or other places you don’t serve? A: The mile problem will be solved early next year. We have basic agreements with Virgin Atlantic and Virgin Australia that will be fully reciprocal. We also have agreements with Cathay Pacific, Singapore and Emirates that will develop into frequent flier relationships. This is quite interesting and certainly will be a welcome change. Even if the reciprocity rates aren’t particularly great – and I’d bet they will not be – having more earning and redemption partners is a great thing for customers. Of the independent US-based carriers Alaska Airlines has done the best at this (and they’ve also been around the longest to figure it out) while JetBlue has a minimal partnership with American Airlines. Growing those relationships is about more than just having an interline agreement for ticketing and baggage; it is nice to see Cush recognize that value. Q: In Dallas, you’re telling fliers to "dump your older airline for a younger, hotter one." American responded by slashing fares to San Francisco and Los Angeles. Can you survive this fare war? A: We’ll survive. At current fares, it will not be a profitable route but it wouldn’t be such a loss-making one where we would consider any type of reduction. You have to be in Dallas-Fort Worth if you’re going to be a business airline. This is a particularly interesting view on the value of certain markets (elsewhere in the interview there is also discussion of pulling out of the Toronto market). Apparently there are some markets so important that losing money over a long period of time while serving them is OK. He doesn’t note just how much they’re losing or for how long they’re willing to keep losing that money, but it is quite a claim. Definitely makes me wonder about the long-term plan once again. Q: Do you think that American is on the right path? A: It’s hard to tell. There’s a culture there that is perhaps a bit risk-averse. In the past, it was always an airline that was willing to accept risk. The industry’s consolidated around it and all of a sudden American finds itself in third place. I don’t know if they have the answer. I do know their top guys. They’re smart, capable but at some point you need to stick your neck out a little bit if you’re going to get out of a rut. Well, cutting chunks of the route map is one version of sticking ones neck out, I suppose. For a guy so keen to run a very limited airline with a very limited route network, it seems that telling others who are running a much more complicated setup that they’re not trying hard enough is an entertaining stretch. That’s not to say I think the AA plan is particularly great, but they also cannot really effect wholesale change just by flipping a switch. There’s a lot of momentum to be dealt with there. Q: Mile for mile, airplanes burn more fuel than cars, trucks or trains. Do you think this poses a problem for the industry? A: If we don’t find a way to clean up air travel, we’ll become a pariah. We’ll be what the coal companies used to be. How about, "Planes are ever improving in efficiency and they allow for connectivity in the world and great advances that cannot be had any other way," as a response rather than shying away from the problem with your tail between your legs? Q: In ten years, do you see Virgin America being a full-blown national airline? A: That’s not our goal. The biggest discipline we need to have is not outgrowing the model. That means maybe 100, 150 aircraft, probably no more. The goal would be to be consistently profitable, the highest quality airline where we can hopefully make a few hours of people’s day a little bit nicer. This is perhaps the most interesting of all the responses. It makes sense from one point of view, but that is a very simplistic approach. No airline is going to be all things to all people; the numbers simply don’t work out. At the same time, however, artificially limiting yourself to only serving major cities or only serving limited frequencies is a sure fire way to make sure that you’re not going to meet customer needs. And when serving those markets becomes a matter of entering into markets that area already rather competitive the revenue pressures are going to be even harder. I respect the theory but I don’t think it maps to the real world very well. It seems to me that most of the answers Cush offers up are rather small-ball or short-sighted views of the market and how to operate successfully in it. Maybe I’m wrong, but I’m certainly not feeling all warm and fuzzy about the company’s future reading his views. Read the whole story here if you want more. The statement that you “have to be” in DFW clearly shows a lot of indoctrination during his AA days. Re the 100-150 plane cap, that makes a lot of sense. If you really only serve dense, highly populated markets, feeder routes from ITH and SYR just aren’t needed. Perhaps they could become basically something akin to QF’s CityFlyer offering in Australia. Overall, air travel needs to change. If it is done by leveraging smaller and more fun air carriers, it will be a welcome change. For those of us that enjoy premium cabin travel for nothing more than taxes, it will be a challenge. But, for the millions of other passengers who strive for comfort and enjoyment, it might attract them to airlines once again. I notice they didn’t mention their abortion of a switchover to SABRE. They STILL are screwed up from that, over a month later. The last point about limiting Virgin America’s growth was very interesting. I remember when Southwest Airlines ONLY served the southwest. Now it’s bought AirTran and is buying planes that can reach Hawaii. Maybe Virgin America doesn’t plan to grow that big any time soon, but ruling it out seems premature. I agree that it seem premature to say that there isn’t the potential to look bigger, Scottrick. But even if they only run those “main” routes they are going to need more planes if they want to run them with frequencies that make them appeal to the business travelers willing to pay the cash it takes to make an airline profitable. As to the suggestion that it will take VX or the like to make travel better for the “rest of the folks” I’m not so convinced. I’ve got no problem with new entrants showing up and shaking up the marketplace a bit. It happens from time to time and often there are good things that come out of it for passengers, at least in the short term. But a bunch of new airlines only serving major cities or only serving one small region of the country (or world) are not necessarily the solution for all those millions. For starters, many of them don’t live in those major cities. And even the ones who do might want the opportunity to fly to more destinations. Starting off with a plan to not allow yourself to grow means you’re writing off business before you even give it a chance. That doesn’t make sense to me. Since I don’t live near enough to VX destinations I haven’t flown them yet. But having heard good feedback about their hard and soft products, I’ve always thought it would be nice to see them grow and give some new competition to the big boys one day..especially with all the consolidations/mergers going on. It’s not as if new players are entering the game on a regular basis, obviously. But apparently that isn’t in the cards. Kind of odd for him to take such a firm stance… who knows like Scottrick said, WN once was adamant it wouldn’t branch out and has changed its tune. I’ve only flown VX once. I was in F on a dirt cheap fare (<$250 for LAX-JFK IIRC) and I thought it was great. The coach product just isn't all that much better than everyone else out there. Mood lighting doesn't add inches to the seat width or pitch. And the number of carriers with TV (some free, some not) is growing. Add in the fact that many now bring their own IFE on tablets or similar and the "differentiating" factors Cush cites don't really seem to be there and there absolutely is no indication that there's a premium being paid for those services, at least not at time of booking. There are some indications that folks are paying a pretty penny for various incremental "fees" but not much that carriers can generally drive a revenue premium at this point just for being "cool."